Now, Baklava wasn’t exactly new to us. It is a common enough sweet in Los Angeles and San Francisco due to their plethora of international residents. But since we were in the countries where phyllo and Baklava originated, the dessert is literally everywhere. Turkey was particularly hell bent on selling this, having stores comprised of wall to wall stainless steel trays filled with a soup of bite-size Baklava, honeyed syrup and nuts competing with the Turkish Delight vendor next door. Sometimes the phyllo was shredded instead of flat, green instead of light gold and sometimes the nuts were walnut instead of pistachio. 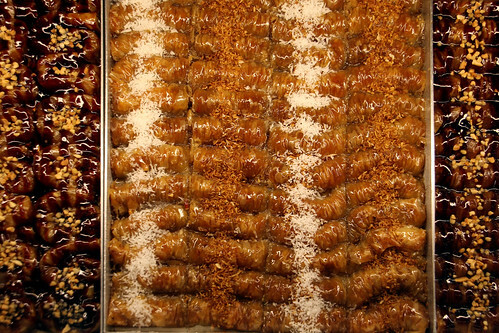 The Greeks took their Baklava seriously as well, but where the Turkish would stop at bite-size, Greece thought big. 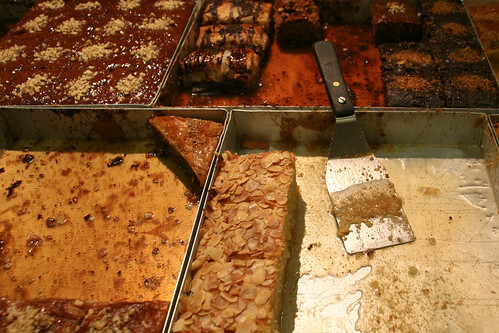 They would go so far as to have Baklava the size of cake slices, covered or filled with chocolate as well as honey. A particular variation we tried is made with phyllo dough and custard called Galaktoboureko (space burrito! no, not really). We would recommend this version for a sweets craving because it has a little more complexity of flavor with less of the sickly saccharine syrup in pure Baklava. Overall, Baklava is fun to try but often we found the gooey honey more like corn syrup and the phyllo had softened from sitting too long, making the dessert rather mushy, lacking any real texture and mind-numbingly sweet. Do yourself a favor if you get the chance to try this treat: try to find it fresh, as natural as possible and hopefully, with crisp brittle layers. 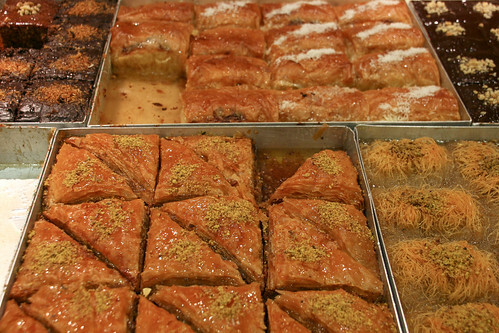 A good Baklava can be rewarding to the palate, a bad one can give you diabetes. Also, phyllo is used in many different dishes like the famous Greek Spanakopita (spinach in phyllo) and Turkish Borek, filled with everything from cheese and vegetables to chicken. The crispy texture of the phyllo giving way to the juices of the filling can be very enjoyable cuisine. I would love to try some of those alternatives you mentioned for the baklava! The dessert was just too sweet to keep sampling when I was in Bosnia. But! I loved the bureks in Bosnia – I imagine they were very similar to what you found in Turkey, do they serve them with plain yogurt in Turkey? Umm.. I think I’m having a sugar coma right now just looking at those pictures. Wow! The varieties are amazing. I love the little cigar shaped baklava (and borek too for that matter) with the crispy filo and pistachios. Too much extra syrup takes away from the dish. That’s so disappointing. A good, crispy Baklava can be amazing. I can just imagine the soggy, gooey-ness of an old one. Yuck. I’ll definitely be on the search for a fresh one when we hit Turkey.